I have been working on this project on and off for a couple of months, and finished it in time for the Bloggers’ Quilt Festival, which Amy over at Amy’ s Creative Side hosts twice a year. It is an experimental piece, which ended up as a wall hanging of approximately 70 x 70 cm. My idea was to layer several fabrics with holes in them in order to achieve a three dimensional effect. I wanted all the holes to have their edges finished in a different colour for each fabric layer, to make them stand out more. Sewing all those holes took some time. When the top layer was finished, I re-auditioned the rest of the fabrics. Wondering which fabric to choose for the second layer. It ended up being a dark red with gold specs. Further on, wondering what to choose for the bottom layer. It ended up being green with a gold net on top. The quilt is entered in the Wall Hanging category. 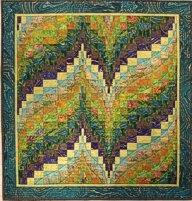 Be sure to head over to the Bloggers’ Quilt Festival to see all the wonderful entries. Imponert!! Det grønne med gull over var en veldig god ide! It’s beautiful, well done! 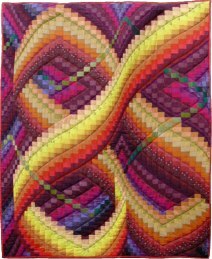 I’d never heard of the blogger’s quilt festival – I must go and check it out. ohmygoodness! the ovals are stunning, what a brilliant idea! thank you for the inspiration, i’m sure i’ll be dreaming of oval cutouts for days now! This is absolutely beautiful! I’d pay good money for a quilt like this! 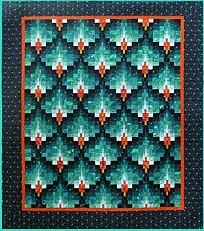 This quilt is amazing! You have a true talent. you always have wonderful ideas ! This quilt is incredible and brilliant! Your layering technique is amazing and effective! Love this! This is incredible! It’s one I could look at for a long time and just fall more and more in love. So original, such polished workmanship, and I love how you have both holes AND the gold netting, which adds to the texture and complexity of the piece. What an interesting quilt! I love the layers and textures! all of the layers and texture are incredible! Truly inventive and unique! Love what you did with this. I’ve had Angela Beasley’s Rose Window Quilts book for years but never would have thought to do them this way. Would love to see what you do next with this technique! BEAUTIFUL! 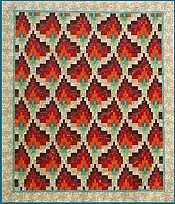 Reminds me of the Molas made by Kuna Indians. Yours is a real winner! I am completely mesmerized by your quilt. I have done mola projects but I can’t figure out how you did it so the color was showing on the edges. Did you needle turn appliqué those edges? I am totally inspired and would love a clue on how you did this. Thank you very much, Sarah J.